Our son is 15. We find it very difficult to get him to concentrate on studies. He is rebellious, unwilling to listen to any advice, and always overconfident. He is brilliant at extra-curricular activities — he is a top footballer in school, and has cleared four levels in music from Trinity College, London. He usually starts studying a day before the exams, doesn’t focus for more than 30 minutes on his books and secures 50% marks. At present, he is in the class IX and will be appearing for the ICSE exams soon. We need your advice on how we can help him concentrate on studies. You say he does not concentrate for more than 30 minutes on his studies. Is this only with his books or also with stuff that he enjoys doing? If he has a general concentration problem even with music or sports, perhaps you should see a doctor who may be able to help you on that count. But from what you write, I think it is only the school work that does not hold his attention. Your question echoes what many parents face: having a talented child with plenty of potential in “non-formal" areas and little or no interest in what the “system" demands! Your son sounds particularly gifted, no doubt. And today, youngsters like him have a whole universe of options open to them. This is something you should feel assured about. Having said that, you are right in wanting him to work on his academics in a more serious and committed way. It is difficult for children like him to make the connection between a sound academic record and his own pursuits. How does one get the child to not reject and neglect studies outright? We, as parents, teachers, counsellors, guides and friends of these youngsters, will have to make that connection for them. You could perhaps even have the school bring up this subject for all the kids — have a counsellor or any appropriate guest speaker talk to them about the application of academics to their dreams and goals, be it sports, the fine arts, even DJing, or any field under the sun. The way things are set up today, many youngsters just do not see how what they study has any bearing on their interests. A 15-year-old only knows what he enjoys and what he simply doesn’t enjoy. However, if you (or the school speaker) can find ways to make the connection between the “sixers" and the “net practice", you will have gently pushed him to sit up and accept the academic slog a little better. Without lecturing him, you could perhaps get him to understand how a good academic record will open precisely the avenues that he is so keen on. It will ensure more choices — admissions into better institutes, possibilities of scholarships, be it in music or sports. The other thing is that most kids this age and with these kinds of talents and interests feel trapped by school work and just hope to “get it over with" soon. You could also introduce him to the idea of a liberal arts education — one that will allow him to combine his interests and the pursuit of a degree/qualification — for a few years down the line. Check out these options yourself before you speak to him, so that you, too, can be assured that there are many avenues open for a boy of his talents and leanings. Simply repeating that a good academic record is a must and that he needs to concentrate on studies will not work, as you have seen. Find some way for your son to have a personal stake in doing well. We shifted to a new city four months ago, and my 11-year-old son had to change schools. He has had a lot of problems adjusting in his new school. Otherwise a happy child, he has started to grumble before going to school. I have tried to talk to him and have also spoken to his teachers, who are trying to be helpful. But things seem to be spiralling downwards. In the past few weeks, he has become very reticent and remains cooped up in his room all the time. Please help. Relocation is always tough on kids. We all have issues, big and small, handling change, and for a child it’s even more difficult because, beyond a point, he or she doesn’t even understand or agree with why it had to happen in the first place. So, besides the newness of it all, they are often resentful about the move, and tend to feel hostile towards you for this situation. Try to draw him into a conversation about the specific things he does not like about the school, and see what you can offer to fix the situation, or what you can confidently tell him will change as he settles in. 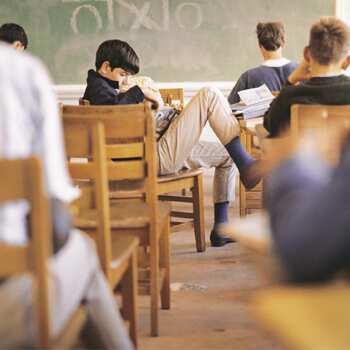 Remind him about some of the things that he didn’t like about the previous school and try to find some examples of how, in spite of his reluctance or fears at that time, he did cope and got round the problem. Perhaps you, as well as his father, could have a chat about how you, too, miss some things about the old house and area or city and how you are learning to adjust to new things. Without lecturing or “giving gyan", as they say, about change being inevitable, find a way to demonstrate this to your son and, equally, to demonstrate that it almost always can be turned around to work for you. No doubt, this is not an easy concept for you to etch and for him to absorb. At the moment, he is just a small boy feeling out of sorts, and seeing nothing to look forward to. On top of it, adolescence is round the corner, and that brings its own issues into the picture. You could draw him out of himself a little by exploring the neighbourhood, or asking him to call over any new acquaintance. Perhaps you could invite some neighbours with kids? You’ll have to lead by example — go out of your way to find new things to do, places to explore and people to connect with. The other exploration could be to find how he can continue with old activities — if he played drums or basketball where you lived earlier, find out where and how he can continue to pursue them. He may respond warily and unenthusiastically to your efforts, so don’t expect “results" immediately, but keep at it. It’s important to plan some of these emotional aspects of relocation for your kids, to minimize uncertainties. It should start right from giving them the opportunity to say goodbye to friends and schoolmates and teachers and neighbours, take down numbers and email IDs and ensure some continuity this way. At the other end, in the new place, you will need to inject some enthusiasm and forward-looking activities, as well as seek out sensitive, welcoming people in your new life. For us adults, a planned move to a new place can feel like a fresh start or an opening up of opportunities. For children, moving is invariably unsettling and even frightening. So stay close to your son, without crowding him, and don’t let him slip into a listless and unhappy state. Read more insightful suggestions on bringing up children in Gouri Dange’s book ABCs of Parenting (Jaico, ₹ 175).